Our drive down to Long Beach from Oceana was uneventful. Roads were pretty good for the most part until we got into Seaview, Wa where the campground is located. We turned onto the road leading to the campground only to be stopped by a construction crew because of a ruptured water main. We could have gone around the stoppage but would have had to disconnect the car to turn around. With the delay predicted to last only 20 minutes, we did what any enterprising RVres would have done. We shut the rigs off and made some coffee! Our timing couldn’t have been better either. We finished our coffee just has the works crew gave us the all clear signal. Ranger Andy met us at the gate to check us in. The park was not busy at all and we had our choice of spots. The park is divided into two separate areas, the second of which is closer to the beach. We chose the second area so I could connect to the internet with the Datastorm. Connection took very little time. We both had 50 amp and full hook ups for our two night stay. 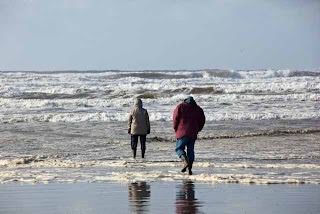 We went for a walk on the beach Tuesday afternoon but were almost blown away by the strong winds. Skies were very grey and rain didn’t take long to arrive. Wednesday was laundry day. I stripped the bed and had the linen and towels all washed and dried before noon. 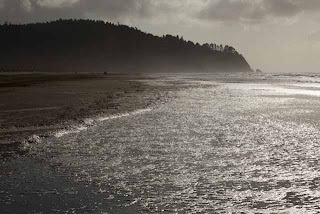 Next, we were off south on Hwy 101 for a little scouting trip into Astoria and Warrenton, OR. We checked out the small Costco there, but opted to go to Fred Meyers for better produce and smaller quantities. Of course we had to stop at Starbucks for a cuppa before heading back. There is a new, much bigger Costco being built just down the road from the old Costco. The ride into Warrenton was quite scenic even with overcast skies and rain. We crossed 2 low bridges to get across the Columbia River into Oregon and will cross those same bridges again when we leave Long Beach to head for Whalers Rest in South Beach, OR. We’ve decided to pass up on our stay at TT Seaside in Seaside, OR. Weather has just been terrible and we’ve decided to go to Whaler’s Rest instead which is a little farther south. We got back to Long Beach around 4 pm and I had to get started on supper right away. Chris and I had picked up some very thick pork chops at a Costco some time back and put them in the freezer. After thawing, I stuffed them with mozzarella and threw them on the BBQ. Fresh snap peas and small potatoes as side dishes along with fresh strawberries and Jane’s home made sticky stuff for dessert. Jim and Jane even got to watch Coronation Street on satellite TV. Tomorrow, we are on the road to Whalers Rest in South Beach, OR. Forecast is for more rain the whole way there. We’ll see just how accurate the forecast is. I know there is sunshine out there somewhere. Thinking we won’t see any until we get into California though. This entry was posted in Campgrounds, Internet, Satellite TV, Thousand Trails, Washington.